Did you know that someone once challenged A Light in the Attic by Shel Silverstein, because one of the poems “encourages children to break dishes so they won’t have to dry them”? That’s just one of many farfetched (and sometimes hysterical!) reasons people find to challenge books. 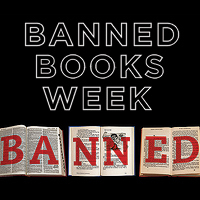 To highlight intellectual freedom, Banned Books Week will be celebrated September 21-27, 2014. This special week celebrates books that have been challenged for removal from public access and presents a wonderful opportunity to rope in readers – in particular reluctant, and sometimes rebellious, teen readers. Make a Display: Do Not Read This Book! The label of “banned” might just entice them to give a book a try. Lure them in with a great tag line for each book…but don’t give it all away! Next, enhance your display by choosing a prominent central location and roping off a section or blocking it with caution tape. To get ideas of most commonly challenged titles, visit the ALA’s Banned Books site here. Research and list some of the reasons books we all love have been challenged on a bulletin board. Give patrons a place to post their thoughts in response to those reasons. Some silly reasons books have been banned can be found here. Contest: What is Freedom of Speech? Organize an essay or poster contest where children and teens are to put pen to paper and talk about free speech and what it means to them. If one has the freedom to speak, does one have the freedom to listen?